The Royal Coronation and Grand Tournament! Forums » Notice Board » The Royal Coronation and Grand Tournament! Event The Royal Coronation and Grand Tournament! ..The war against the tyrannical Queen has ended and a new chapter begins for Venaris. 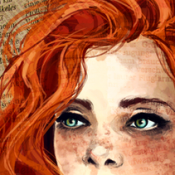 All across Rivera, from the town center to lamp posts on the outer edges, have appeared notices written in a flowing script..
To register for events, please contact Alarilak Ulvbane via Discord (Thromity#2931) with this signup info or reply in the thread below. All times are potentially subject to change due to factors beyond our control. Disclaimer: All fighters must accept the possibility of defeat and subsequent skill loss if one does not yield quickly or visibly, but there will be NO player looting allowed. Any player looting is an instant disqualification from ALL events for the rest of the tournament and may result in action OOC from the GM team via ticket. 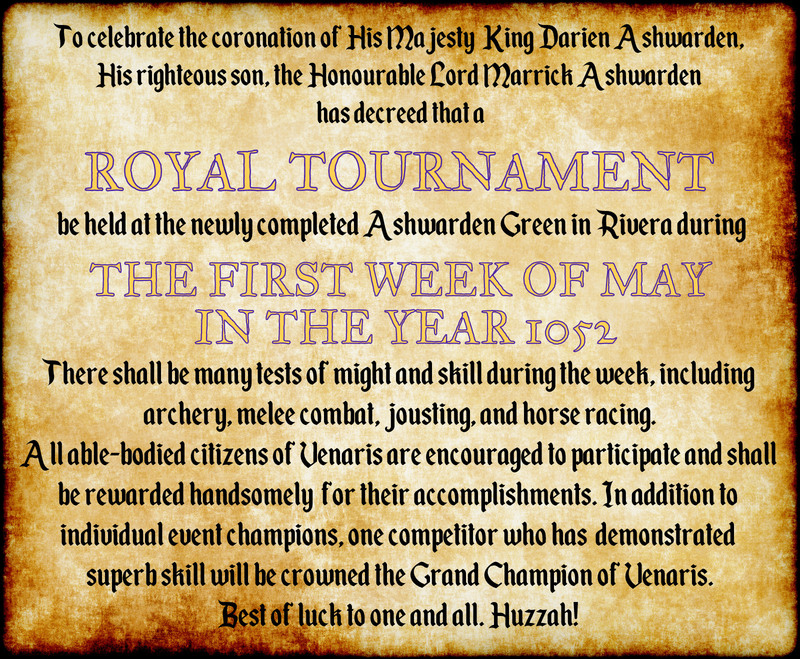 To celebrate the coronation of His Majesty King Darien Ashward, his righteous son, the Honorable Lord Marrick Ashwarden has decreed that a ROYAL TOURNAMENT be held at the newly completed Ashwarden Green in Rivera during THE FIRST WEEK OF MAY IN THE YEAR 1052. There shall be many tests of might and skill during the weel, including achery, melee combat, jousting, and horse racing. All able-bodied citizens of Venaris are encouraged to participate and shall be rewarded handsomely for their accomplishments. In addition to individual event champions, one competitor who has demonstrated superb skill will be crowned the Grand Champion of Venaris. Best of luck to one and all. Huzzah! The schedule has been updated today. Please see: https://goo.gl/MNMTeQ for full details. Basically Archery has been merged together for Noon PST today with the Drunken Horse Crawl and will be dependent on who shows up. We also now have a feasting hall for everyone prepared by the wonderful Dagny Almstedt. Thank you to everyone who came out for Day 1 and we hope you enjoy Day 2! Al and I would like to extend a huge "Thank You!' to everyone who was able to attend the Rivera Royal Tournament & Coronation. We had quite a good turnout and it looks like many, if not all of you, had a good time. There were a lot of great battles and excellent roleplay from what I witnessed. Congratulations to all the winners and participants. The winners will receive their prizes formally in-game at a special future "Winners Recognition Event" (to be announced relatively soon with an formal notice prepared directly by the King). A special appreciative thanks to the GM team as well for their imperative assistance with running the event alongside us as well as providing support, suggestions, and feedback in the pre-planning stages, as this proved immensely helpful to our success. Thank you for your faith and flexibility in allowing us to run the events. There may be future tournaments this iteration pending time and desire from event organizers and the player base. The "Ashwarden Green" facilities are open to the general public for their use, however, any formal event hosting should be run by the GM team for prior approval. Thank you again to one and all, and we hope to see you at another event soon!